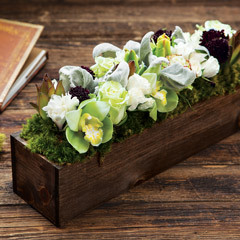 A collection of all-time favorites gift wrapped in a hand crafted wood crate with ribbon. Petite includes rocky road popcorn, white chocolate peppermint bark, milk chocolate pretzels, mixed nuts, and red Aussie licorice. 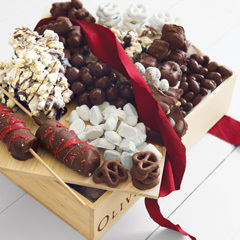 Medium adds white chocolate peppermint popcorn, chocolate covered toffee squares, and dusted toffee almonds. Large adds two bags each of rocky road and peppermint popcorn, chocolate and peppermint candy covered sandwich cookies and graham crackers, sweet toasted pecans, and green Aussie licorice. 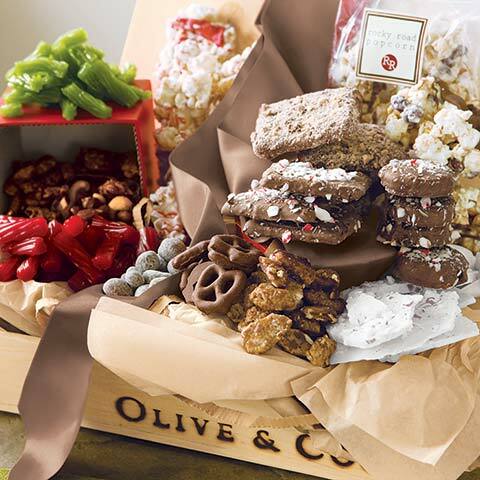 Extra large adds an extra bag each of peppermint popcorn, white chocolate peppermint bark, toffee squares, green and red Aussie licorice, mixed nuts, and milk chocolate pretzels. Lots of Little Goodies is rated 4.8 out of 5 by 61. Rated 5 out of 5 by Jordan from Client's LOVED their gifts! I bought these as a "Thank You" for my clients in 2018 and they all loved their gift boxes. 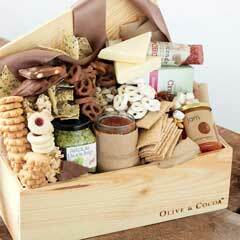 I definitely will be using Olive and Cocoa in the future to show my clients they are appreciated. Rated 5 out of 5 by Jmig from Delicious This was a gift for my boss and she and her husband said everything was delicious! 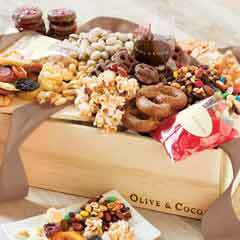 Rated 5 out of 5 by Cleon from Corporate Holiday Tradition We do these for our holiday corporate gifts each year. I couldn't be happier with the product and the branded crate! The process is easy and we always get great feedback from the recipients! Rated 5 out of 5 by Maggie47 from Nice variety. Best licorice ever. Great surprise from our daughter. Was impressed with the variety and tastiness of each package. Rated 5 out of 5 by KMcc from Great customer service, quality products We purchased multiple orders to ship to our partners for the holidays. They were beautifully presented, delicious and extremely well received by all our partners. The customer service we experienced throughout the entire process was top notch. Our Account Specialist was extremely responsive and answered our questions or concerns quickly and efficiently. Thank you!